Pop quiz! Anybody gone through one of those days when you just want to throw the telephone into the toilet, crawl under the bed, and solace yourself with chocolate and Kleenex? Or maybe you know the kind of day (or week, or month, or year) I’m talking about, but your chosen response involves throwing large and heavy objects from the top of very tall buildings or mountains? Or maybe, like a friend of mine, you prefer to shoulder an ax and hack down saplings? By this point, you’d all better be scratching a big fat black check in the “Yes” box. If not, you’re either lying or catatonic, and, in either case, you probably won’t be interested in the rest of this post, so you can stop reading and return to your regularly scheduled tea and biscuits. However, for those of you honest people who answered correctly, allow me to add one more response to my admittedly incomplete list of cathartic techniques in the paragraph above. How about… reading? Or writing? Why Do We Find Stories So Comforting? Since flushing the telephone only seems to back up the plumbing (not to mention frying the phone), and since I ceased to fit beneath my bed some time ago, I often find myself forced to take other measures. And, more often than not, my gut instinct is to reach for the surprisingly cathartic power of the written word. Interestingly enough, the very word catharsis comes down to us by way of the Aristotelian theory that suggests “a purifying of the emotions brought about in the audience of a tragic drama through the evocation of intense fear and pity.” At its core, the idea of losing our own troubles by immersing them in those of someone else remains closely linked to the literary experience. 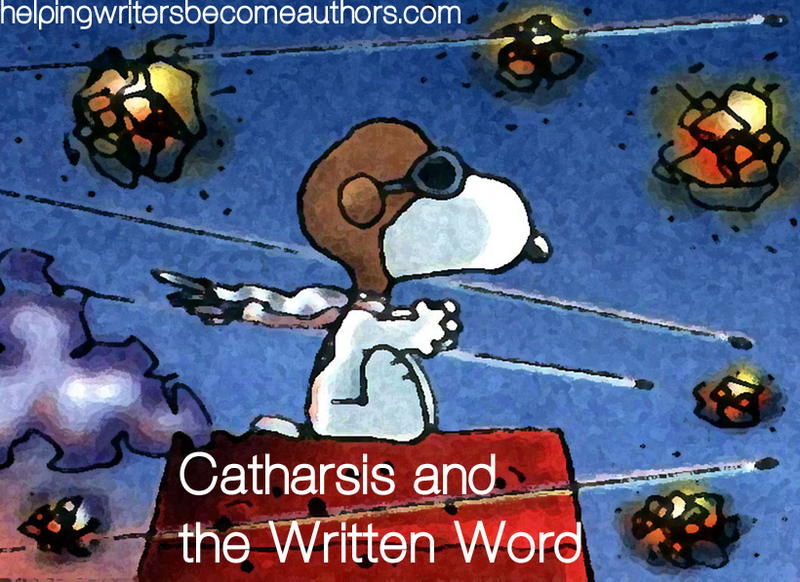 I had no intention of writing about catharsis when I sat down this evening to type up this week’s post. But having spent a week on the rough side of life, the title for this post understandably popped to mind. When I’m depressed, hurt, frustrated, or angry (or, more likely, all four at once), the urge to lose myself in someone else’s story hits me with redoubled force. When I open the pages of a book, suddenly I’m no longer little me facing down the firing line of my own problems. Like Snoopy, suddenly I’m flying my own Sopwith Camel, taking on the life of a World War I flying ace. Or maybe I’m lost in Narnia with the Pevensies. Or, very likely, I’m fighting off Malaysian natives with Joseph Conrad’s Lord Jim. If fiction had no other redemptive power, then escapism, by itself, would certainly seem blessing enough. Even more than the stories of other writers, I find solace in my own writing. Last Sunday, minutes after having a bombshell explode at my feet, the very first instinctual response to follow the petition of divine guidance was the urge to immerse myself in my writing. Why? Why this powerful sense of security amid the hurricanes of my imagination, why this need to purge my emotions in the crucibles of characters who have sprung from my own brain? The whole notion of catharsis has always fascinated me. It’s a bit sadistic, when you think about it: watching the suffering of others so our own burdens might be lightened. But perhaps it is, in part, what the Apostle Paul intended when he instructed us to “rejoice with those who rejoice, and weep with those who weep.” If we can find it in ourselves to identify with the rejoicings and the weepings of other humans around us, is it not a natural progression to identify with the trials of characters we know better than we sometimes know ourselves? Or is the catharsis perhaps found in the knowledge that, in a story, we can always see the light at the end of the tunnel? Human beings aren’t known to be very farsighted when it comes to trials. We tend to think that because we can’t see beyond the clouded present, the clouds must therefore continue all the way to the horizon. But, in a story (especially stories of which we are the authors), we know the trials must end. We can feel the pile of pages beneath our thumb slowly slipping away, and we know resolution—for better or worse—is right around the corner. The girl is going to fall in love with the right guy. The good guys are going to stomp the bad guys into subatomic particles. Or, if worse comes to worse, and a happy ending doesn’t await our heroes, then at least we’ll get to know why. Perhaps that’s why I read. Perhaps that’s why I write. Certainly that is at least part of the reason I seek catharsis in the magic of the written word. Tell me your opinion: Do you turn to writing or reading in times of trouble? I read Aristotle’s Poetics, and found his remarks on cartharis very interesting. @Galadriel: Haven’t read it, but now you’ve got me needing to check it out! @Katherine: Sometimes just doodling in a journal is a help! I love this! It is so true. Fiction owns my heart. Aye, mine too. I think it owns all novelists! Stories *are* life – which isn’t to say authors don’t need to get out and live. But reading widely and deeply is one of the best ways to grow, not just as a writer, but as a person.